AirDrop is the fastest and most convenient way to wirelessly send files from an iPhone or iPad to a Mac. While AirDropping from iOS to Mac OS is easy, how it works may not be particularly obvious to some users, and many people don’t know the feature exists at all. 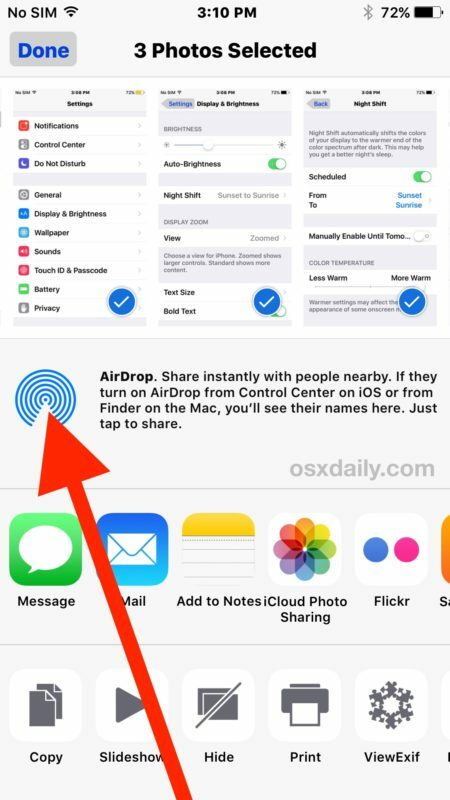 Learning to use AirDrop to send files from an iPhone to a Mac is easy, and it offers a simple and reliable way to transfer photos, videos, notes, and other files between nearby devices. To use AirDrop from iOS to Mac OS, you will need a modern version of iOS on the iPhone or iPad, and a modern version of Mac OS on the Mac – generally speaking the newer the software releases the better, so you’ll want to be sure you update your devices if you are having any difficulty. 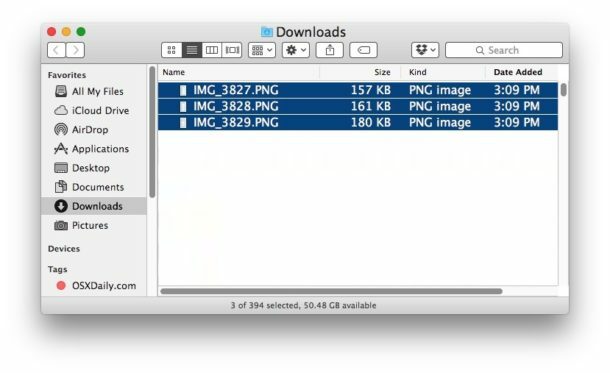 Beyond that it’s not much different from AirDropping between Macs or other iOS devices, let’s review how this great feature works to send files across platforms. 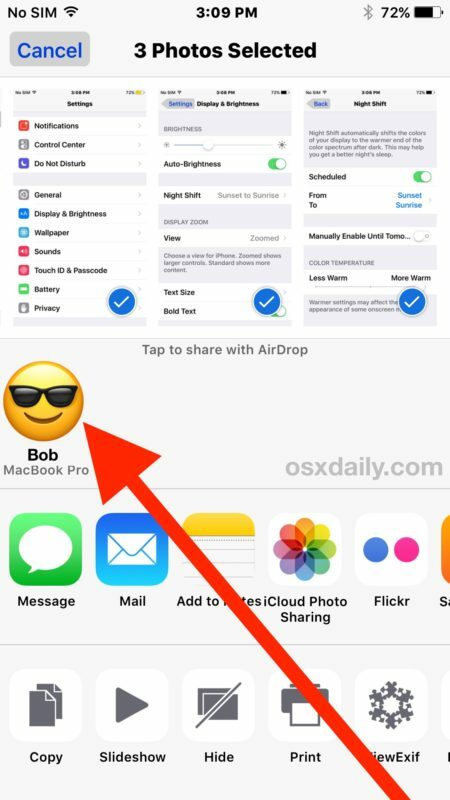 Any images, files, photos, videos, or other data transferred Airdropped from iOS to a Mac will always go to the active Mac users Downloads directory, which is where where AirDrop files go by default. The Mac will continue to allow accepting inbound AirDrop file transfers from iPhone, iPad, or other Macs as long as the Finder AirDrop window is open. If you are done transferring files with AirDrop on the Mac, simply close the AirDrop Finder window to stop allowing further transfers. If you’re at all confused then it is best to try this out yourself by opening the Photos app on the iPhone or iPad and then AirDropping a picture or two to a Mac. Despite being somewhat confusing to explain and demonstrate, it’s actually quite easy to use in practice. The key things to remember are that you must open the AirDrop Finder window on the Mac for it to be active in Mac OS, and you must tap on the AirDrop icon in the Sharing menu of iOS to be active on the iPhone or iPad. A few things to keep in mind if you’re experiencing difficulty: AirDrop requires a reasonably new iPhone, iPad, or Mac, Bluetooth must be enabled, and the devices must be within reasonable reach of one another (the closer together the better). For the most part, AirDrop “just works” but if you are having problems the refer to this guide for troubleshooting AirDrop not working in iOS, and if it’s seemingly not even available then refer to here for what to do when AirDrop is not showing up on iPhone or iPad at all. On the Mac side of things, as long as the Mac is vaguely modern with a somewhat recent Mac OS or Mac OS X release and has Bluetooth, AirDrop usually works just fine without hassle. Do you use AirDrop to transfer photos and files from an iPhone or iPad to a Mac? Have any tips or comments about AirDropping between iOS and Mac OS? Let us know in the comments. Do not have your router connected to your iMac via ethernet because although you will be able to AirDrop files from your iPhone to your iMac, you will (not) be able to AirDrop files from your iMac to your iPhone!!!! I would be delighted if I could airdrop from my MBPro to my wife’s iMac. I’ve tried everything. She can see my computer just fine and airdrop to me. I’ve never been able to get her computer to show up on my laptop. Did you try setting airdrop on her computer to ‘everyone’? that should do the trick…sometimes you can’t see other devices if their airdrop is set to ‘contacts only’, but you should be able if you change them to ‘everyone’. Also make sure your wife’s iMac has all connections turned on (Wifi, bluetooth). Check out the suggestion in Robert’s comment as well, maybe switching the iMac from ethernet to wifi is the solution. If a computer can see you, but you cannot see them, try having them send you a file. For the few seconds of the transfer they should be visable on your computer, giving you a chance to drop a file on them. 1. MUST be on the same network. This has tripped up a lot of people who swear they’re on their home network, they are in fact on a neighbour’s unlocked network — or on the 5GHz “channel” of their network that uses a similar but not the same network as their 2.4GHz devices. 2. Both devices MUST have BOTH Wi-Fi and Bluetooth enabled. 3. Both devices MUST have AirDrop available as a sidebar item (for Macs) or available in the swipe-up Control Center (iOS). 5. Both devices must be within 30 feet of each other. 6. One other tip from Apple: Find out if the Mac has “Block all incoming connections” turned on in Security & Privacy preferences. 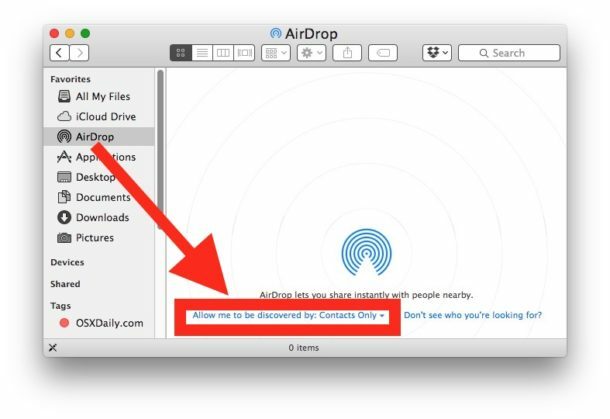 A Mac won’t receive items using AirDrop if this setting is turned on. You do not need to be on the same network to AirDrop, AirDrop creates an ad-hoc wi-fi network between two devices to send the file, thus circumventing a traditional wi-fi network. Yes you need WiFi enabled and Bluetooth enabled, but you do not need to be on a network. 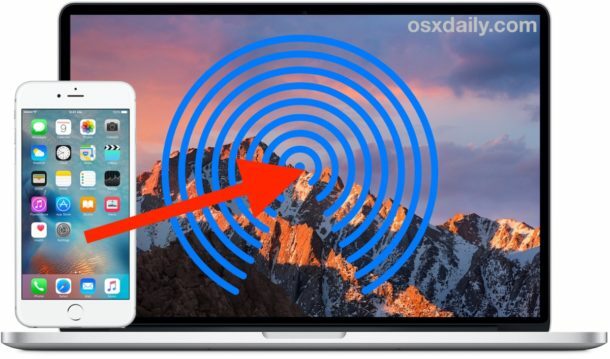 You can actually AirDrop two devices that are no where near a network, try it. I use AirDrop frequently for sharing pictures between iPhone and Mac, it’s faster than anything else. I just transferred a photo from my iPhone (iOS 11) to my MBA (10.13.4) and Bluetooth is OFF on both. Oops, sorry, jumped the gun on this one, BT is ON on both devices. I had it off but starting AirDrop turned it on for me. Another Tip: You need to be disconnected from VPN. Had some issues until I disabled a VPN connection then it worked great. AirDrop is the fastest and most convenient way to wirelessly send files from an iPhone or iPad to a Mac. It isn’t the concept or even the procedure, so much, although I would obviously be happier if it were more reliable and didn’t require Bluetooth 4.0, so that it would be enough to share the same subnet. It’s the stupid limitations iOS has and that AirDrop basically enforces. I have a URL that represents an RSS feed on my Mac’s clipboard. It runs Yosemite, so I don’t have “Universal Clipboard”, and even if I did I wouldn’t want to use the cloud to send my clipboard data. How do I use AirDrop to send it to my phone, so I can paste it into my feed reader? I have no app that will simply open plain text files, from which I could theoretically copy and paste. In the end, I had to hand-craft an OPML file, just to send this one URL via AirDrop. I use Airdrop quite alot, in theory it is a simple tool and sometimes in practice too, but most of the time iphone can’t see the MBP – even when its just sent a photo 10 mins ago!! I have found that even though bluetooth is enabled on both devices you have to open bluetooth preferences on the MBP again for the iphone to see it. If anyone is having problems try that, it might help, it works for me. Tried airdropping a picture from my iPhone 6s (iOS 10.2.1) to MacBook Air (macOS 10.12.3). Had a Finder Airdrop window open and connections set to Everyone. Selected a picture on the iPhone and tapped on the share icon. My MacBook Air did not show up, all shown was an airdrop icon (the blue beam). After a lot of testing, restarts and so on, I finally got it to work by simply switching bluetooth on the MacBook off and then immediately on again. Then all of a sudden I could see the MacBook icon appear on the iPhone, and by tapping that icon the picture was transferred. However, here is a weird thing: Even if I have NOT an airdrop window open on the MacBook the picture transfers ANYWAY! On the MacBook I get a notification for a few seconds in the top right corner of the screen, saying “received photo from (name of my iPhone)”. So, no need to open an airdrop window!? How do I AirDrop from my Mac to my cat? The cat has his own IP and is on the same wireless network. Does the cat need Bluetooth also? I was looking forward to this information and using it. But when I opened AirDrop on my iMac and “Allow me to be discovered by contacts only” a message told me to sign in to iCloud. I thought I could do this on the wireless network. Now I feel I’m missing the whole concept. I do not wish to enable iCloud. Can I still use AirDrop? I used to be able to AirDrop between iPhone 5s and MBPro 2011. Not so after a couple of recent past iOS and OS X / macOS updates. End up using Dropbox or Notes app for many things, which seems silly. Even being able to use Bluetooth File Transfer would be helpful (used that between an old Samsung phone and the MBAir). Also, I can AirDrop between a 2013 MBAir (El Cap) and my 2011 MBPro (Sierra), only after seeing (only on the MBAir) a tiny, nearly invisible phrase at the bottom of the AirDrop finder window: “Connect to an Older Mac.” Clicking this (need to do it every time) allows discovery of the MBPro by the MBAir, so at least I can AirDrop between those devices. The MBPro 2011 + iPhone 5s is my setup too. I see that Apple’s AirDrop page [http://support.apple.com/en-us/HT203106] says this so I guess we’re boned. I ran the AirDrop On Unsupported Macs command on our NBPro, MacPro 2008, and MacMini Server 2011, but no machines appear in their AirDrop windows. If Bt 4 is now required that may explain it, but I don’t think it was a requirement in previous AirDrop versions (which date back to MacOS Lion). Personally I think that Airdrop is THE most confusing “feature” that Apple ever invented! when I use my iPhone to share pictures to my MBPro it works fast, easy, flawlessly without me having to do anything on the Mac’s side! But when I want to share stuff with my students (al using latest OS MBPro’s) it never works, really annoying! What irritates me the most is that this way of transferring data is totally counter intuitive, so I guess that’s why most people never use it…. “Allow me to be discovered by: ContactOnly” drop down menu does not appear within Finder/Airdrop window on my MBP. Both devices have wifi & bluetooth turned on. No drop-down menu. At the bottom of the AirDrop window, you will find it in blue text, just click on the text to get the choice. i hate to be a party-pooper – but when i am in a hurry to send an image between my iphone and mac (and visa-versa) – i just use imessage on either to text myself the file in a jiffy! I do this too, iMessage for picture transfers is fast and easy, I find it is much more reliable than jiggering with AirDrop and hoping it will work. These instructions would have been easier to follow if you had used scenic photos in your example instead of screen shots of settings windows that look as if they are part of the process, not just example photos. And maybe circles instead of arrows.